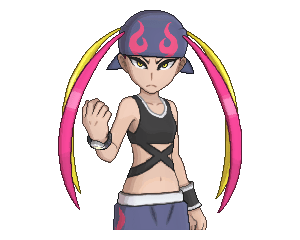 After defeating Plumeria in the main storyline, Pokemon Trainer Plumeria appears in Pokemon Ultra Sun and Moon as a trainer in the Battle Tree. Plumeria, the former Team Skull Admin, appears in the Battle Tree as another trainer for the player to fight. Like always however, she still specializes in using Poison Type Pokemon save for her using a Lurantis as one of her possible choices. Having also a Salazzle, she can also take down any possible Bug, and Grass Type Pokemon should any of your Pokemon have that particular type as one of its primary or secondary types. While going through the Super Singles Matches, she appears after every 10 battles. However, she cannot repeat Pokemon in battle in which she can only use one of each. The following Pokemon that will be used by Pokemon Trainer Plumeria will be chosen at random. Since no two Pokemon of the same species may enter, only one of the possible Held Item and move sets will be chosen. Pokemon Trainer Plumeria’s party will consist of Pokemon at level 50. Since majority of her Pokemon are Poison type, your team better be equipped with some Psychic Type Pokemon or Ground Type Pokemon. Or, you can also bring Steel Type Pokemon which are immune to Poison. The main threats to your group would either be Gengar or Salazzle – Salazzle having Fire type attacks and Gengar being partially a Ghost Type. Pokemon that will shine in this battle ground would be Pokemon like Garchomp due to it being a Ground Type Pokemon. Though, you’ll have to watch out for Salazzle if it has Dragon Pulse. Krookodile can also deal heavy damage due to it being both Dark and Ground Type which will check the Gengar while dealing damage to the rest of her Pokemon. However, have a Fire Type Pokemon or even Poison Type Pokemon will do against the Lurantis.